In the past two years, we’ve seen a number of new metal 3D printing technologies emerge, looking to take on more established, legacy processes. These range from variations on fused deposition modeling and binder jetting to inkjet printing and digital light processing. Now, a new challenger has entered the ring with a totally unique metal 3D printing technology and some pretty hefty financial backing. Boston-based startup Digital Alloys has announced a Series B round of funding to the tune of $12.9 million. With this latest round led by G20 Ventures and with participation from Boeing HorizonX Ventures, Lincoln Electric, and Khosla Ventures, this brings the startup’s total funding to $17.9 million, since Digital Alloys was established in 2017. 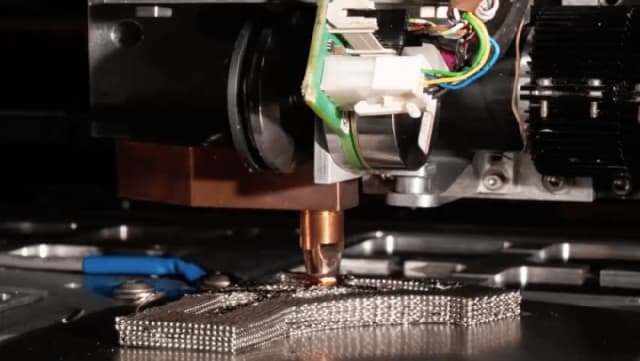 The army of new metal 3D printers that have emerged in recent years are all aiming to address the issues presented by legacy metal additive manufacturing (AM) technologies, such as speed, material capability, cost, size, quality and repeatability. In this way, the case of Digital Alloys is no different. In contrast, joule 3D printing is meant to be cheaper, faster, simpler and more reliable than other approaches. The way that it achieves this is through a focus on the method for heating the metal feedstock and exactly what type of feedstock it uses. Unlike powder bed fusion systems—which use very expensive, specially refined metal powders—Digital Alloys’ process prints with metal wire, already widely available at low prices in a variety of materials. It also doesn’t use a laser or electron beam to melt the wire, but instead relies on resistive heating, also known as “Joule” or “Ohmic,” wherein an electric current is passed through a conductor to heat the metal wire. With faster printing times, productivity is increased, thus allowing the machine to pay for itself more quickly. And it does so using a precision motion system. Altogether, McCallum described the entire process as “very simple,” which not only improves the odds of reliability, but also makes it possible to introduce something yet to be seen in the metal AM space: closed loop control. Systems manufacturers are increasingly introducing new monitoring technologies into their machines in order to enhance repeatability. These include a slew of sensors, cameras and software that perform such functions as measuring the intensity of light generated from a laser melting metal powder in order to determine the exact heat of the melt pool, as it sprays and splatters molten droplets in the build chamber. As advanced as these methods have become, most metal 3D printing technologies are notoriously unreliable. Parts must often be printed numerous times to achieve the optimal print parameters, support structures and object orientation. The difficulty lies in the fact that the physics of energy beams heating metal powders is extremely complex, leaving companies like 3DSIM (since acquired by ANSYS) to create elaborate algorithms that can simulate the printing process to better improve the odds of a good print. Joule printing, on the other hand, is said to be simple enough to be more closely controlled and monitored. McCallum says that, with Digital Alloys’ process, it’s possible to know exactly where each voxel is because of printhead’s contact with the wire. The amount of metal deposited is easily determined due to the machine’s precision wire feed system. How much energy is being used to heat the wire is known because heating is performed with an electric circuit. The one almost-exception may be Markforged, which previously claimed to be developed a closed-loop system for its composite AM technology. Because Markforged’s metal 3D printing process is based on a similar platform, it may be possible that the company hopes to bring closed-loop control to its Atomic Diffusion AM systems. However, those prints still need to be fired in a furnace. According to McCallum, there is no heat treatment required for Joule-printed parts in order to achieve full density. Metal 3D printing is also notorious for the amount of post-processing required to transform a part from that which comes out of the machine to what is presented on trade show floors. This ranges from wire cutting the component from its substrate and cutting off support structures to performing hot isostatic pressing, in order to improve the density of a part. McCallum said that objects made with joule 3D printing are 99.5 percent dense or greater and that their crystal structures are isotropic. For that reason, there’s no need for any heat treatment. He said that, like all metal printed parts, there may be some post-processing required to improve the surface finish of items made with joule 3D printing and, in that way, they will be near-net-shape parts. But when McCallum discusses near-net-shape parts, he doesn’t mean the “blanks” referred to by users of directed energy deposition (DED) systems. Some DED systems use a thick wire, heated with an arc, laser or electron beam to create parts, with molten metal dripping or spraying to create much wider print lines. CNC machining or other processes are then used to create the final part. In the case of Digital Alloys’ technique, the layer height and line width are determined by the diameter of the wire. The startup’s first system can print with wires ranging from 250 microns to 1mm. McCallum also says that the system can print 45-degree overhangs without supports. “For something like a 90-degree overhang (a roof), you use the multi-metal capability. The support would be in a second metal that is dissolved or melted away,” McCallum said. By the end of the year, the company aims to be able to print at a rate of 5 to 10kg per hour, opening up the possibility of mass production. Though Digital Alloys will increase the build volume of its system in the future, McCallum believes that volume applications are already possible with one or a small number of printers. In particular, the focus of the technology will be on hard-to-cut parts, such as components made from titanium, Inconel and stainless steel. This includes conformally cooled tooling. For hard-to-cut metal parts, a great deal of scrap metal is generated during the machining process, meaning a waste of expensive raw material. This is compounded by the cost of using a machine capable of cutting such materials. 3D printing offers a unique alternative that wastes almost no material, while adding unique capabilities. For instance, in the case of tooling, it’s possible to incorporate conformal cooling channels that allow the tool to cool off more quickly, thus reducing cycle times. Also, as shown by 3D printing provider PROTIQ, topology optimization can be used to reduce the weight of tools, cutting further seconds from the process of lifting and switching out tools. So, when will customers be able to get their hands on these systems? Not until later next year, according to the CEO. The startup plans to begin as a provider of 3D-printed parts. 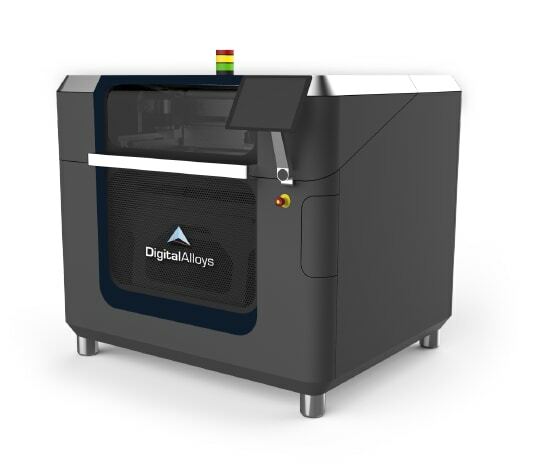 Having already received orders from over a dozen companies, Digital Alloys aims to deliver the first printed parts by the end of the year. Thankfully for Digital Alloys, the startup has just received a big injection of funding that will lead them toward these goals. The company will use the $12.9 million to hire more engineers and expand its production facility. Along with the funds, Digital Alloys will be receiving all that comes along with partnering with such big names as Boeing and Lincoln Electric. Based on McCallum’s own track record, the likelihood of success is pretty favorable. He’s been in the venture capital space for the past 22 years and Digital Alloys is the third startup that he’s launched, having already sold the other two. With that in mind, we’re sure to see more news from the company shortly. To learn more, visit the Digital Alloys website.